I want to introduce you to London with a tour suitable for beginners, dedicated to all who arrives in the City for the first time, for a classic “Friday to Sunday” weekend , a tour that allows you to have an overview of the city, postponing the insights to a second visit. My flight is scheduled for Friday morning at 7:30 from the Milan Linate airport, with a British Airways airliner, for which I found an excellent offer on Skyscanner. I love flights early in the morning, they allow me to enjoy a full day in the city of destination and, with London, I will also earn an hour, thanks to the favourable time difference. I arrive at the airport by car, the secure car park that I booked on Parcheggilowcost is a couple of miles from the departures, the price for these 3 days is less than 40 euros and the shuttle leaves me in front of the terminal, I recommend it because they were efficient and very friendly. The flight is in perfect time… we leave!!! During the flight I take a nap, to be rest and full of energy for the day. Here I am in London. The International Airport of Heathrow is the busiest in the world, but the efficiency of all the staff and the perfect organization of each area will make your transit very pleasant. Once landed, I remind you that the UK entrance controls are very punctilious, so don’t be impatient. If you have a passport you will save at least 10 minutes of your time : the checks in this case are in self-service mode in a reserved area , well indicated by the stewards. How does it work? You will have to place your passport on an optical reader that will scan the necessary data, then follow the instructions to let you take the iris photograph; when this is done, the glass doors of your box will open and you can proceed to the exit. If you only have an identity card, the controls are standard and made by the operator, you just have to get in line: I remind you that your card must be in perfect condition and that, if papery, it must not have been renewed with the oil stamp on the last sheet, as it is not recognized as valid in this country. If you have any doubts about the validity of your identification documents, please contact the Municipality or the police station of your city before departure, or visit this site or similar sites in your Country. I always travel with a passport , therefore I arrange everything in less than 5 minutes and have plenty of time left to stop in one of the airport cafes, and finally have my breakfast. The convenience of landing at Heathrow is having the Piccadilly Line (blue line) just some steps from the arrivals, well indicated with the unmistakable sign of the London Underground – if in doubt, follow it!!! The metro allows you to reach central London without spending the train or bus ticket that usually is needed at Luton, Stansted and Gatwick airports. Consider these additional expenses when you are looking for the best flight. Often a low cost flight, combined with a train ticket, has the same final cost of a scheduled flight on Heathrow, with one hold baggage included. Before getting on the metro, please go to the automatic ticket machines to get a ticket or an Oyster card, the city transport card, valid on the tube, bus, boats and some railway lines. The card has a cost of 5 pounds for deposit, then you will top up it with the figure most congenial to you, directly at the automatic machine (with cash or cards). For 3 days a 20/25 pound refill for the city zones 1 and 2 should be enough. If you prefer to buy the Oyster in advance, I would like to point out the booking site, thanks to which you will receive it by post mail at home, and the website of the London transport company, to study the rates according to the times and the different London areas you cross from the 1st to 9th. Here I am at my accommodation, not far from Hyde Park and Lancaster Gate, in a lively street full of cafes, restaurants and shops. I ask the reception to keep my luggage until the check in time and, after a shoes change, I head back to the metro to reach my first destination: Piccadilly Circus. Piccadilly Circus is unmistakable, portrayed in many advertisements and movie scenes, the heart of London and always a meeting place for tourists and Londoners. The traffic on this streets intersection is really crazy, but I stop to admire the big LED advertising screen (renewed in 2017) and the statue of the Angel of Christian Charity, inaugurated in 1893 in honor of the philanthropist Lord Shaftesbury, but now confused and renamed by everyone as a statue of Eros, the God of love… perhaps more romantic? I reveal a curiosity about the origin of the name Piccadilly Circus: once in this area there was a tailor shop known for the creation of rigid collars called Piccadils, while Circus is the name that the British give to any round or circular intersection. I now take Regent street to reach then Trafalgar Square; the walk is about 10 minutes long , all slightly downhill and therefore very pleasant to go. Once arrived at Waterloo Place, I turn left and enter the majestic “The Mall”, the avenue which links Buckingham palace to the arch of Admiralty, a building made by three arches, that bonds the Mall with the square of Trafalgar , where I arrive in a few moments. Here I am in Trafalgar square, crowded and full of life! This famous square is dedicated to the memory of the battle of Trafalgar, in which the Royal Navy led by Admiral Nelson defeated the French and Spanish fleets during the Napoleonic wars. In memory of this battle there are, throughout the square, monuments and statues to celebrate that victory: the column of Nelson, 30 meters high, is often climbed to attract public attention on social, political or environmental issues; the four bronze lions are often children’s play areas and, among the various pedestals surmounted by statues of military leaders, there is a free estate for the performance of contemporary works. This square is also famous for the Christmas carols sung under the huge Christmas tree that is set up during the advent, and for the various street artists who daily pour here to paint, sing, dance and entertain tourists. Behind the square is the National Gallery, one of the most famous museums in the world, where I will enter for a few minutes, impatient to reach the Van Gogh Room, one of my favorite painters. Admission to the Museum is free, but a small donation is appreciated; at the entrance you will find some transparent containers for banknotes and coins, but also some Museum insiders involved in collecting donations by credit card, using a tablet: this is progress! If at the end of your Londoner holiday you will save some small coins, this is a good place to leave them. I stop in front of Van Gogh’s sunflowers, a sort of ritual for me, every time I come to London; the eclectic and tormented spirit of this artist has always fascinated me. Built over the remains of two pre-existing churches and consecrated in 1726, it is today known for its intense artistic and musical activity; the evening candlelight performances are very evocative, while during the Midday performances, with free admission, much space is given to emerging artists. Luck wants me that a piano concert is starting, I sit down, I listen to the presentation of the young Asian artist and then the beautiful notes, immersed in this peaceful atmosphere. My destination is now the London Parliament and the Westminster Abbey cathedral; to enjoy the sun, I decide to walk out of the crypt of St. Martin in Fields and take the Northumberland Ave., just after Trafalgar. In this direction I have the opportunity to pass by the historic Pub Sherlock Holmes, where I suggest you to stop for a beer with friends or to enjoy fish and chips. The upper floor is worth seeing! I remind you that the original house / museum of Sherlock Holmes in not here but at 221b of Backer Street, the metro stop with the same name is not far away from it. At the end of the road I find the beautiful Whitehall Gardens; I visit them immediately, attracted by the peace and the surrounding silence. Aren’t they beautiful? My walk continues with the Thames on my left and I quickly arrive at the corner with the Big Ben and the Parliament. The symbolic clock of Westminster is unfortunately in restoration (the last one took place in 1985). On this occasion, in addition to cleaning works and arrangement of the internal mechanism, an elevator will be installed to make the entry for the disabled people possible. It seems strange not to hear his tolls, which mark the time of Londoners since 1850! if you want to see the Big Ben in all its glory again, you have to wait until at least the end of 2021, but I can comfort you by adding an archive photo, taken a couple of years ago. Now I pass the Parliament of London, so imposing and austere in its Victorian neo-gothic style. The palace still houses the two chambers of the Parliament of the United Kingdom: the House of Lords and the House of Commons. Click here if you want to read the story of this incredible palace. Westminster Abbey shines right next to the Parliament. The best time to visit is during the 8 o’clock function, walking in the silence of the aisles and cloisters, before the crowd arrives. In the internal gardens there are also vegetable gardens with aromatic and medicinal herbs, fruit trees and beehives, once the main source of livelihood for the monks. The cathedral is full of treasures and famous monuments. Here all the sovereigns were crowned by William I and buried 17 rulers, up to George II. In the Poets’ Corner rest among others Charles Dickens, William Blake and Rudyard Kipling. Isaac Newton, Charles Darwin and, recently, Stephen Hawking, are buried here; for me, so passionate about science, physics and astronomy, it is truly a unique place. And finally… for Tabloid lovers, the abbey has hosted many royal marriages. Outside the abbey I find a food truck where I take a vegetarian sandwich for lunch, listening to a street artist playing the bagpipe just close to me. I continue to walk towards Westminster Bridge, the bridge that leads to the South Bank. Recently the bridge has been equipped with a cycle path and the pedestrian sidewalks are now protected by shattering barriers, set up following the terrorist attacks happened around this area in the last 2 years. There is a beautiful view from here, I take some pictures and I head on the south bank of the river, towards the London Eye. The tallest Ferris wheel in Europe was inaugurated in March 2000, for this also called “Millennium Wheel”; it is 135 meters high and consists of 32 cabins that can accommodate up to 25 people. His name has changed over time, based on the sponsors that have succeeded, since January 2015 is called Coca -Cola London Eye. The ticket is certainly not cheap: 25 pound the standard ticket, but if you want to go up I recommend you to book online in advance and go there in the evening, London by night is magical! Today I won’t go up, but I don’t lose the show in 4d at the bottom of the ticket office: it’s free and pretty impressive, it describes in a few minutes the London atmosphere between sounds, people, perfumes and… soap bubbles, so if it’s your first time in the city, you must definitely see it. Just below the wheel starts the Jubilee Walk, which continues straight up to Tower Bridge and has rehabilitated an area of the city that, previously, appeared rather neglected. Along the way it is pleasant to see how children and families spend their time here, the river bank seems like a beach and street performers catch my attention, especially the soap bubble wizard surrounded by amused children. A little further on, I met the Tate Modern, the main art site along the riverside and once a power station. The Tate is comparable for prestige to the Metropolitan Museum in NY, admission is free and, in addition to temporary exhibitions, you will find the stable ones of Picasso, Monet, Matisse, Brancusi, Pollock, Rothko, Riley, Duchamp and Warhol. Touts minds gait histrionic – the whole world recites – this was the motto that waved proudly on the flag of the Globe Theater, the place where I am now, a few minutes walk from the Tate. To be Honest, this is only the faithful reconstruction of the original Elizabethan theater, which was totally destroyed in a fire, and where many of Shakespeare‘s works were represented. The season starts in May until September, being outdoors remember to bring a raincoat! Right next to the Globe is the Millennium bridge and on the other side stands St. Paul’s Cathedral; it is almost 17:00 so I make a detour in that direction … I have an appointment I can’t miss, follow me! The Millennium Bridge is a steel suspension footbridge, which links the Backside area, where I am now, with the City; its construction began at the end of 1999 and it was opened on 10 June 2000, two days later than expected, but the unexpected oscillations, due also to the tide of crowds that crossed it, forced its closure after only two days. The definitive arrangement that eliminated the wobbles, both vertically and horizontally, occurred only in 2002 when the bridge was reopened on 22 February. Today the Millennium Bridge can accommodate up to 5000 people at the same time, yet it is still light-headed with the name of “Wobbly Bridge” (unstable bridge). I cross the bridge, arrive in front of the City of London School and then to St. Paul‘s Cathedral; after a small inspection of my bag at the entrance, I sit down and wait. I arrived at my date, the evening vespers. The first note makes me startle, the chorus of white voices is superlative and gives chills; unfortunately it is not allowed to take pictures or recordings, respecting the young age of the singers; I advise you to dedicate your first visit to St. Paul during evening vespers, you will come out enchanted, regardless of your religious belief, they will excite you. At the exit I take a few photos, cross the Millennium Bridge again, walk next to the Globe and head to the Borough Market. To reach it from this area of London, I suggest you continue on Bankside with the river on your left, just passed the pub “The Anchor” (highly recommended) the road will become Bank end and then Park Street, follow it all up to cross Stoney Street ( 8/10 minutes on foot): the Borough Market is right in front of you. But what is the Borough Market? It is a food paradise, a gastronomic market held every Thursday, Friday and Saturday in a covered area that, for over 1000 years, is dedicated to the food trade. Here you can find food of very high quality, both local and international. In addition to shopping you can also have a snack or a real lunch, with dishes cooked at the moment that satisfies all palates. I resume my journey towards Tower Bridge, but I am so tired to decide to call a taxi, I raise my hand and the first one passes is free. In a few minutes I reach my destination, and here it is… Tower Bridge. Built in 8 years and inaugurated in 1894, the bridge is mobile and therefore allows the passage of the largest boats on the Thames. Pedestrian walkways were closed to the public in 1910, as most people had to stop for a long time waiting for the bridge to rise again. Since 1982 pedestrian crossings have been covered and today they are part of an exhibition itinerary, which illustrates the history of this bridge. Always a symbol of the city and the protagonist of millions of shots, it is an unmissable step, even if rather fast; if you want to visit its interior, the entrance fee is 10 pounds. I stop on a bench and observe the nearby fortified castle of the Tower of London, a medieval work that has had several uses over the centuries: arsenal, treasury, menagerie, home of the Royal Mint, home to the jewels of the English crown, prison. Its construction began between 1066 and 1087 by William the Conqueror, but was completed only in 1272/1307 by Eduardo I. The Crown Jewels are now kept in the Waterloo Barracks, near the Tower. The traditional guards of the most beautiful fortress in London and Unesco heritage, such as Tower of London, are called Yeoman or Beefeater; with their characteristic black and red uniform today are more like a sort of high-level tourist guide, as well as protagonists of the ancient key ceremony about the closing of the doors, which happens every evening, since 700 years, by their hand. To take part to the ceremony, at the symbolic cost of a pound, you have to book months and months in advance, on the page dedicated to the event. (Tower of London – Ceremony of the Keys) Tickets are available 12 months in advance! During Christmas time, a suggestive ice-skating rink is set right outside the castle, while the “Coppa Club” restaurant, not far away from the castle, equips 8 heated transparent PVC Igloos on its terrace, where you can dine like in a real Lappish house, with a breathtaking view. The sun is going down and I’m exhausted and hungry. I head to the “Tower Hill” tube station and with the Circle Line (yellow line) I arrive directly at Paddington; I recover my luggage, still in the reception, I settle in the room and after an endless shower I go down for dinner. At the reception they direct me to the nearby main road. After a quick glance I decide to stop in a small restaurant where they have Fish and Chips, one of the most typical dishes of the country, tasty and cheap, just what I need! I eat quickly, fatigue is a lot, my pedometer marks that today I did 22 km walk, not bad what do you say? After 8 hours of deep sleep I am fresher than ever, ready for my second day in London. I get out of bed and go out on the terrace: the morning is warm and there is a beautiful sun. I’m really lucky, the umbrella will stay in the backpack today. It is not obvious a so “Mediterranean” weather here! I take a shower and go down to the ground floor of my B & B, I’m a bit hungry and the typical “full English breakfast” will be perfect for me: toasted bread, eggs, bacon, sausages, tomatoes, beans and some roasted mushroom. What a delight! This kind of breakfast is also served in many pubs in the city, until 11 am, I recommend it because it allows you to have a full stomach for many hours, it’s like a small lunch, but at a reduced price. I’m staying at the Piccolino Hotel, less than 5 minutes’ walk from Paddington Station and 10 minutes from Lancaster Gate Station, at the entrance to Hyde Park. The restaurant area is cosy, there are some lonely travelers ready, like me, for a new day in London. After some information sharing and a last cup of coffee, I get ready to pack my backpack and in 10 minutes I’m on the road. Before going down to the metro, I visit the surroundings of my accommodation, the side streets are a charm, hidden corners of peace in such a big city! Try to get lost in unknown streets, you will always find something amazing in this city. My first destination is Notting Hill: it’s saturday, the day of its unmissable antiques market. I get off at Notting Hill Gate stop (Tube: Central Line – Red line) and, taking the main road, I follow the signs to “Portobello market” which take me on Pembridge Road, then I turn left into Portobello Road. Along this path you will already have a first idea of the neighborhood: elegant Victorian houses, colorful and with small entrances aboard the sidewalk, among which I notice at n. 22 the George Orwell‘s London house: I literally devoured his books. A writer who deserves further study. How to forget 1984? You must know that these old pastel colored houses have maintained their rural and independent appearance, despite being in a very busy area. Continuing my walk I meet a singular street artist: Alice in Wonderland’s Mad Hatter, who invites tourists to sit at his tea table for a photo. A typically touristy idea, but I notice the frame at his feet, with this sentence : happiness is not a destination, but a way of life. It seems written specifically for us travelers, what do you think? I continue on Portobello Road and arrive at the famous shop which sells plates and advertising signs, all made of tin. You cannot fail to notice it, it’s really unique. I cross the road, continuing on Portobello Road, and I walk in the market area, the beating heart of this neighborhood, which became famous in the early 2000s thanks to the movie Notting Hill with Julia Roberts and Hugh Grant, a film that has dramatically increased the prices of properties in this area of London. The flea market is an explosion of colors, the crowd walks between a banquet and the other looking for some occasion or a small souvenir. The antique dealer Alice’s, on the right side of the street, stands out above all, with its red shop window; I always take a look at his banquets and this time I linger on its precious ceramics. The weather is now really hot. Walking forward I meet the first food and fruit stalls, arranged in the middle of the road; I order a take-away orange juice, perfect solution to save time drinking and keep on looking around. Fruit, vegetables and food sold in this area are of excellent quality, you can decide to have lunch here sitting on a wall or sidewalk, listening to good music, weather permitting. Street artists entertain tourists with their unpublished songs; some of them sell their CD, a “kilometer zero music” and often really very good, a genuine souvenir! Halfway along the market you will find, on your right, a small square where you can admire a complex of typical houses in pastel colors, a corner certainly good to be photographed. The last part of the market develops under a road overpass, so it is a partially covered area. If it’s raining, go directly here! I focus on the stalls on the left, where retailers of vintage clothes and jewelry are normally found; here I often bought used jackets and coats, in excellent condition and with a Brit touch! Spend some time here, without rushing! You can find many handcrafted items and accessories and meeting who creates them will be useful to practice your English and come home with something more than just a souvenir. At the bottom of this part of the market, at the corner with Ladbroke Grove, there is a Pret a Manger, a fast food/coffee chain that uses fresh and organic products; there is always a vegetarian choice as well as hot soups, fruit and yoghurt. I stop here for my lunch break because, you will not believe it, it’s already 13 o’clock. If I have to eat quickly without spending a fortune, I prefer this chain of restaurants, kindness is at the highest levels and also the quality. I take a fresh salmon salad and a soft drink, the atmosphere is relaxed, I enjoy the background music and the free WIFI, looking on Google Maps for the best bus that brings me near Hyde Park. Found! It’s number 52. I finish my lunch and reach the bus stop where, in a few minutes, my two floors bus arrives; I get on and pay my ride with the faithful Oyster card, I take then a seat upstairs from where I have a panoramic view of the route. I enjoy the whole neighborhood seen from above, looking at beautiful views including a pub entirely covered with flowers. After about 10 minutes, I get off at the Royal Albert hall stop, just in front of the Albert Memorial. The Albert Memorial is a monument located in the Kensington Gardens, wanted by Queen Victoria in memory of her husband, Albert of Saxony-Cobourg’s-Gotha, who died prematurely at the age of 42 in 1861, due to typhoid fever. The monument was built by Sir George Gilbert Scott, in neo-Gothic style, and houses inside a protective canopy the statue of Prince Albert, covered with gold leaves. The love for her husband, pushed Queen Victoria to make other memorials, including those of Manchester and Edinburgh, always in the same style as the London one. I now walk in the gardens in the direction of Hyde park, not far away; after having passed the Serpentine art gallery, I approached the “Serpentine” pond where I see floating a temporary installation of the Bulgarian great artist Christo Yavachev, “The London Mastaba“, that is the reproduction of a funerary tomb of the ancient Egyptian civilization, realized with 7,506 barrels of oil and held by 32 anchors. Told the author of the work to the press. I know well this extraordinary artist, only two years ago he connected to the mainland, with floating bridges, two of the three islands of Lake Iseo (Lombardy-Italy), a lake very dear to me. Read my article about Montisola and, for further information, click here. Behind me is the Lady Diana Memorial, a place I always visit when I come to Hyde Park. This unique circular fountain was inaugurated in 2004 by Her Majesty the Queen, as a symbol and tribute to life, personality and love for the children of Princess Diana. It is possible to walk freely inside it, as desired by the designers to symbolize the great kindness of the princess; today she would be happy to see the dozens of barefoot children (and some in swimsuit!) having fun in the cool water, playing with parents and laughing noisily. I stop on the granite edge, take off my shoes and dip my feet, warmed by the summer day and the long walk. A 10 minute break in this place is a must, you can breathe joy and peace. Next to Diana Memorial you will find the Lido, a good place to have breakfast or enjoy an outdoor snack, overlooking the pond, or sheltering inside in the colder months; I mention it also for the presence of free public toilets, in excellent condition. Continuing my walk in the park, I enjoy the beauty of plants and flowers, as well as the presence of happy squirrels, who try to get closer searching some food. Hyde park is highly recommended for picnics or a rowing boat trip in the pond; you can also read a good book under a tree or playing yoga and other sports surrounded by nature. From a distance two elegant and colorful figures approach: two newlyweds Indians in their traditional clothes, busy in the celebratory shots of their wedding… how lucky I am to meet them. The beauty of this city is also its cosmopolitan and multi-religious soul. A few steps and I reach Hyde Park Corner, a big crossroads that will take me straight to Buckingham Palace. I pass under the Wellington Arch and take Constitution Hill, what can we say about this place? To be honest, very little; the arch of Wellington was built in the nineteenth century along with the nearby Marble Arch, to celebrate the British victories during the Napoleonic wars (do you remember Trafalgar Square?). Originally above the arch was the statue of the Duke of Wellington, considered by many to be too large and unwelcome even to Queen Victoria. In 1912 the statue was replaced by the current winged goddess of Victory, in the act of descending with her warrior chariot. Today this monument is known as one of the city’s gates, being located on the edge of one of the most important arterial roads in London. A few more steps and here it is on my right, Buckingham Palace! 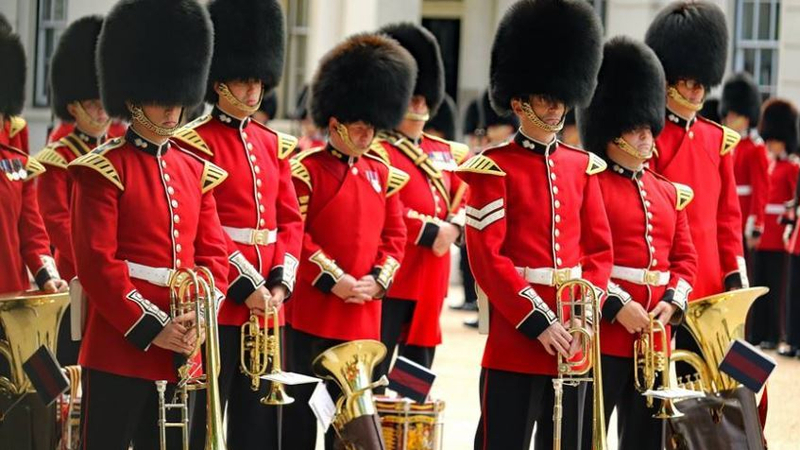 An unmissable stop if it is your first time in the English capital; at the palace Gate there are many tourists who peek through the gate’s bars to see the Royal Guards, the Coldstream Guards, in their unmistakable red and black uniform. From here you have two choices: if you want to reach any other area of the city, the nearest metro stop is Hyde park Corner or Green Park; if you prefer to walk enjoying some peace, continue to St. James’s Park (my absolute favorite) reminding you that halfway along the route you will have the possibility to take the metro, or a bus, near Birdcage Walk, the main road that along the south side of the park. I decide to walk a little longer, I want to get to the bridge on the pond, from where you have a wonderful view of the London Eye, I recommend it at sunset, you will make magnificent photos! You must know that the area in which the park is developed today, was purchased in 1532 by King Henry VIII and originally appeared to be swampy and marshy. The residence of the king was not far (York Palace) why he decided, after the purchase, to reclaim the area to make it worthy and suitable for the royal family. St. James’ Park is the oldest park in London; here you can find well-kept and protected flora and fauna, as well as a colony of pelicans brought here in the mid-1600s from the Russian ambassador, as a gift to Charles II. A little tip: orienting yourself with the metro in London is not difficult at all : study on the map your final destination, locate the line and get off at the trains platforms, choosing the starting platform based on the position of your final stop, compared to where you are in that moment. In practice, you will move following the cardinal directions: East Bound / West Bound / North Bound and South Bound. I arrive at the Covent Garden stop and, upstairs, I find myself swallowed up by the crowd; after a few hours spent in the park, in absolute calm, I feel myself a bit stunned and I stop at the corner of the street, right next to the Tiffany jewelry, perfect place to have breakfast looking at the shop windows, what do you say? Covent Garden is actually a district of London’s West-End, a theater and entertainment area, although tourists mainly pour into its large pedestrian square, full of fashion shops, local handicrafts products and many street performers, including very good singers. In the covered part of the square stands the Apple market, which houses a market of crafts products. Under this covered area you can buy some excellent tea in the many Tea Houses, have a snack in one of the various restaurants or cafeterias, while in the narrow streets I suggest you a visit to Stanfords, legendary shop specializing in the sale of maps (open since 1901) and the Apple Store, inaugurated in 2010 and recently renovated, is currently the biggest Steve Jobs brand store in the world. I reveal you a curiosity: a long time ago, in the twelfth century, Covent Garden was a vegetable garden of St. Peter’s Benedictine convent in Westminster (Covent / Convent). The religious schism marked the turning point and this area later became what it is now: the artistic district of London. I walk around the square and head to one of the small side streets, Floral Street, to greet the entrance of the Royal Ballet, one of the most important dance studios in the world; in that of Floral street are studying girls and boys between 16 and 19 years of age. When I come to the entrance I remain speechless, I can only start dancing. At the end of the street I cross Bow street and head slightly to the left where, in a corner and in all its grace, there is the statue of the Ballerina, intent on fasten her shoe. The work is by the Italian sculptor Enzo Plazzota, inaugurated here in 1988 and positioned right in front of the Royal Opera House, a clear tribute to the youth through this dancer, perhaps busy dreaming her debut in that theater. I take Floral Street again and this time I walk along it, following the signs for Leicester Square, not far away. Leicester Square is the central hub of the famous Soho neighborhood, located between Covent Garden, where I come from, Piccadilly Circus and Trafalgar Square. It is mainly known for its film premieres and for the movie stars participating in it; on the sides of this square, in fact, there are the major London cinemas. Leicester square also houses a small garden in its center, in which there are busts dedicated to the great of the show and the sciences: William Shakespeare, Charlie Chaplin, Isaac Newton. I head towards one of the corners of the square, passing between performances of street dancers and musicians, what a confusion here too! I look with interest at the Swiss-style mechanical clock which is now moving for the 6 o’clock in the evening. If you have children with you or you like M&M’s, the M&M’s Store was opened years ago just next to the Swiss watch, but if you don’t like the smell of chocolate is not a place for you. I stop in the first hall at the entrance, to greet the protagonists of this chocolate world, and take a couple of photos. Now I’m really tired, despite having spent most of my day at the parks of London, my pedometer marks 20 km, not bad even today! unger is taking its toll, I head to the first Pret a Manger I find (at the exit of Leicester Square tube station) and order an hot chicken soup; it’s very good and nutritious, just what I wanted. My strength are now scarce, the evening breeze helps me to take the energies to step down the metro again, change the line to Piccadilly Circus (from blue to brown) and reach Paddington in less than 20 minutes. I arrive at the hotel enjoying the scent of the gardens adjacent to the street, mixed with the noise of the various pubs patrons, who drink and talk outdoors, enjoying the favorable September climate. Needless to say that as soon as I arrive at the hotel I just have the strength to take a shower and put on my pajamas. Another day in London is over, tomorrow will be my last day here and I already feel the melancholy. Better to sleep on it, bye bye! It’s Sunday morning, are you awake? Probably not, you’re enjoying the Sunday relax as it should be, but I got up very early, it’s my last day in London and I want to make the most of the morning, since at 16 I’ll have to be at the airport. After a very good breakfast, I left my bags in reception and now I’m walking to Hyde Park, a 15 minute walk from here. Yes, you’re right, I’ve already seen a lot of London parks yesterday, but I really want to see Kensington Palace, the Queen Victoria birthplace, that was also home to the late Princess Diana. The journey from my accommodation to the park is very pleasant, I am in a very quiet residential area; the only people I meet are the nannies, walking with children, and sportsmen in a jogging suit, many running with their dog who, like me, head for the park. At the park entrance, near the Lancaster Gate subway station, I notice the advance of a small jockey riding with her instructor, ordered in the dedicated lane; it surprises me every time seeing how easy is to practice horse riding in this city. Helping me with the map I head diagonally towards the Kensington Palace and meet a sculptural work that, excuse my irony, reminds me of the painful visits to the dentist. Do You like it ? Walking in the total quiet of Sunday morning, among beautiful trees and turf, I do not realize to be followed by a dangerous character: a squirrel who intrigued by my little figure, tried to hug me. After the first fright, we both laughed. I come near the Italian Gardens, they are beautiful and also crowded; the most early people are here, sitting on the benches reading the newspaper, a book, sipping a takeaway coffee. This park consists of four pools of water with a central rosette in Carrara marble; in the beautiful ponds water lilies remind me of the paintings of Monet and the statues that surround this peaceful area of the gardens, make the atmosphere quiet and poetic. It seems that the Italian Gardens were donated by Prince Albert to his beloved Vittoria, a gift that goes far beyond a simple jewel, what do you say? The restoration marks the final part of Tiffany – Across the Water, a project for the recovery and embellishment of ornamental fountains and drinking through the eight royal parks, supported by a grant of 784,000 pounds from the Tiffany & Co Foundation. Making some stops near the trees or sitting on the lawn, I see the building in the distance. I reach it by crossing a meadow full of squawking geese and then walking on the shore of the Round Pond. The whitest statue of Queen Victoria is right at the entrance to the palace, where she was born in 1819 and where she lived until her coronation and following moving to Buckingham Palace, in 1837. After her, no sovereign lived here anymore; today the private outbuildings host some members of the royal family. The sun is blinding this morning, the white of the statue stands out among the green of the gardens and the brick color of the building. If you want to enter the palace, you must know that the apartments of Queen Victoria can be visited, as well as the Royal house portraits gallery and the ceremonial clothes collections, including those dresses belonging to Lady Diana Spencer. Today I limit myself to admiring it from the outside, having already visited it on several occasions; I recommend a stop in this place, the atmosphere around is regal and inside you will feel transported back in time in the Victorian era, which made England so great. I head to the left sid, where a fence covered with flowers, drawings, stuffed toys and candles reminds me that just two days ago it was the anniversary of the death of Princess Diana, which took place the August 31st, 21 years ago. It is moving to see how many people are still here, saying a prayer or bringing a flower. I was undecided whether to take pictures or not, but in the end I had to share with you my emotion… the atmosphere is composed and there is a huge respect for this sad event. This slow “diagonal” walk from Lancaster Gate to Kensington Palace took me for a couple of hours, it is almost 11 am, so I head to the main High Street Kensington where I will take the bus nr.9 next to the Royal Albert Hall (which we have already crossed yesterday), to reach Brompton Road 87/135, where I will visit the Harrods department store; the stop is a must if it is your first visit to London, but for me it is mandatory for all purchases that have been commissioned by my Italian friends. If you want to get there by metro, Harrods is perfectly connected to the Blue line – Piccadilly Line, the stop is Knightsbridge, right next to the main entrance, the nr. 6 door. These are some slogans that clearly identify the essence of this place: you can find everything you are looking for or that you never thought you wanted. Among the clothes collections of the greatest designers in the world, jewelry, precious furniture, luxury cars, toys, cosmetics… inside the store you will also find art exhibitions of the most famous local and international artists. Today I will come across a temporary exhibition dedicated to Salvador Dali. This department store, now a tourist destination in London as well as a place of shopping of excellence, began business in the rich district of Knightsbridge in 1849 by the will of its founder, Mr. Charles Henry Harrod, a grocer from Essex. In 1985 it was bought by the famous Egyptian businessman Mohamed Abdel Moniem Fayed, it is said for 300 million pounds; sold for 1.5 billion pounds in 2010, today it is owned by Qatar Holding. As soon as you pass the entrance, I suggest you take a map and choose the floors to visit, or part of them; Harrod’s is huge, 93,000 square meters, 8 floors including 2 underground floors and 300 departments. The lifts are 146 and each area is connected to the adjacent one by corridors where, on the floor, you will find different colored lines, to guide you to the different departments. Surely the most visited by tourists is the Gift Shop where several perfect items are proposed as souvenir; very famous are the shiny plastic bags (indestructible), decorated with different designs representing London or Harrod’s himself and the Teddy bears. This is mine, bought many years ago, now it is impossible to find! After completing the purchases I leave and go to the Metro, to return to my B & B and finally collect my luggage, it’s time ti reach the airport with the Piccadilly Line; if you fly from Heathrow I remind you that there is a Harrod’s store, dedicated to souvenirs, at Terminal 5, often with reduced prices. If you have little time you can take the latest gifts of your trip to London while waiting for your flight. And if you do not love shopping indoors? I recommend a good alternative, suitable for a first visit to London: Camden Town. I am now at the end of my three days in London, they flew away quickly but the energy that left me the city will keep me company, I’m sure, until my next trip. Before boarding the plane, I greet you with a photo taken the first day, next to the iconic English phone booth, an inevitable shot for every tourist and, why not, also for every traveler.